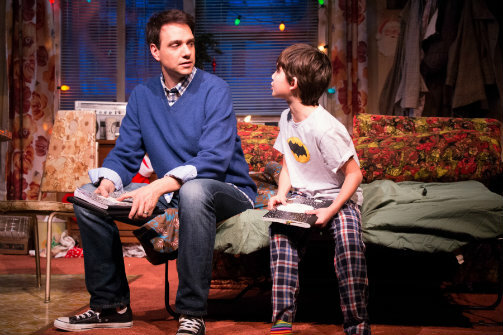 Ralph Macchio and Nico Bustamante in A Room of My Own. Photo by Ben Strothmann. BOTTOM LINE: It’s full-on New York nostalgia in this semi-autobiographical look at an Italian-American family in the 1970s. Theater and therapy have a long history together. For generations, actors, writers, directors and designers have projected their personal feelings onstage in an attempt to explore, discover, or erase aspects of their past or themselves. Though theater can influence therapy (as with Freud’s famous Oedipus complex), therapy more often shapes theater, suffusing works with human anxieties relatable not only to the dramatist, but to the audience as well. There is perhaps no greater example of theater as therapy than Abingdon Theatre Company's A Room of My Own. In this broadly comedic frame tale, the role of writer and director Charles Messina is played by writer Carl Morelli (who, in turn, is played by a perpetually adolescent Ralph Macchio). After being greeted by hearty entrance applause, Macchio’s Morelli begins to tell the audience about his latest play—a look back at his humble beginnings in New York’s West Village. The play, which Morelli writes as it unfolds onstage, takes place in the cramped studio apartment he once shared with his proudly Italian-American family—his profane father Peter (a strong Johnny Tammaro), his equally profane mother Dotty (Joli Tribuzio), and his slightly less profane sister Jeannie (Kendra Jain). Morelli’s younger self (Nico Bustamante) is there too, interacting not only with his family but with the man he is destined to become. We later meet Morelli’s flamboyant Uncle Jackie (a predictably acerbic Mario Cantone), who lives upstairs, as well as Peter’s estranged sister, Jean (Liza Vann). The play’s title comes from a Christmas list little Carl Morelli writes at the beginning of the play. In it, he wishes for three things: roller skates for his sister, an Atari 2600, and, most importantly, a room of his own “like all the other kids at school got.” In the same letter, however, he acknowledges that his parents don’t have the money to give him all of these things. Little does Carl know that his parents not only can’t afford what’s on his list, but they are very behind on his Catholic school payments as well. Carl’s father is inexplicably unemployed and his mother works at a bakery, occasionally stealing from the register to fuel her gambling addiction. As Christmas approaches, the Morelli family faces an uncertain fate. Christmas gives way to New Year’s, and the Morellis proceed to sit in this uncertainty, bickering back and forth as only the most stereotypical Italian-Americans can, before a deus ex machina sweeps in to change their collective fortune. Over the course of the play’s 95 minutes, the relations fight, they love, they celebrate, and they consciously ponder what it means to live during such a specific time, and in such a specific place. Specificity, as it turns out, is A Room of My Own’s greatest strength. The performance I attended felt like one big family reunion- every performer received entrance applause, the audience laughed uproariously at every joke, and, when a character trailed off before finishing a thought, several viewers would audibly suggest a possible ending. I have scarcely seen anything like it at the theater. The majority of those in attendance remembered growing up much like Morelli (and, by extension, Messina) did, and wanted to show their appreciation for his references to St. Anthony’s church and alternate side parking. They were taking in a play, and a very traditional one at that, but they may as well have been watching Billy Joel’s final concert. Underneath the general wistfulness that permeates A Room of My Own is another intriguing storyline, that of its iconic centerpiece, Ralph Macchio. To this day, Macchio is primarily known for his performance as Danny LaRusso in the classic eighties film The Karate Kid, as well as its subsequent sequels. As he discusses in a recent interview with the New York Times, Macchio never really outgrew the role in the minds of fans. He wound up having a long and productive career in film and television, appearing in everything from My Cousin Vinnie to Dancing with the Stars, but will be forever associated with crane kicks and, “Wax on, wax off.” There is something uniquely fascinating, then, in watching Macchio-as-Morelli grapple with the past. When his younger self presents him with lines like, “You can’t rewrite history. It rewrites you,” or “I’m going back. That’s the only way to go forward, right?” I couldn’t help but wonder what was going through Macchio’s mind. In his first stage appearance in 12 years, he dives headlong into themes that any casual observer would assume he’s spent more than a little time pondering. How much of his performance is Morelli, and how much is Macchio? And is there any left over to be Messina? How successful A Room of My Own is as therapy I dare not speculate. But as theater, it is pretty good. The cast is well suited to their roles, and the dialogue—despite its inside baseball tendencies—is snappy and entertaining. Unlike some writers, Messina seems to know how to direct his own work, perhaps because this particular piece is so specific to his own experience. Brian Dudkiewicz’s set is marvelous, right down to the strategically placed Charlie’s Angels board game, and Catherine Siracusa deserves special recognition for putting Mario Cantone in the most fantastically Cantone-y costume ever in the second act. These elements combine to smooth the play’s rougher edges, giving the occasionally cartoonish proceedings some depth and definition. Though I was not able to relate to Messina’s story as much as some of my fellow theatergoers, I admired his ability to make his own experiences so fun to watch. He deserves extra credit as well for bringing more people under the tent of New York theater, people who might not otherwise go see a show at Abingdon Theatre Company or anywhere else. Maybe some of those people enjoyed themselves. Maybe they realized that theater isn’t all stuffiness and pretention. Maybe they’ll see another play. And maybe, like Messina, Macchio, and Morelli, they got to figure some stuff out. A Room of My Own is written and directed by Charles Messina. It is produced by Abingdon Theatre Company. Scenic design is by Brian Dudkiewicz. Lighting design is by Michael A. Megliola. Costume design is by Catherine Siracusa. Sound design is by Ian Wehrle. Props design is by Addison Heeren. Production stage manager is Deidre Works. The cast is Nico Bustamante, Mario Cantone, Kendra Jain, Ralph Macchio, Johnny Tammaro, Joli Tribuzio, and Liza Vann.